Scotland have produced a blistering display of attacking rugby to hand Eddie Jones just his second defeat as England head coach and end the visitors’ Grand Slam aspirations with a 25-13 Six Nations victory at Murrayfield. Led by the brilliance of Huw Jones, who scored a brace of tries, and Finn Russell – criticised before the game but at the heart of Scotland’s best play – the hosts opened up a 16-point halftime lead, with Sean Maitland also touching down. England improved after the break with a converted Owen Farrell try, but Sam Underhill was shown a yellow card to inhibit England’s hopes as the hosts expertly navigated the final 35 minutes to register a famous victory. Following a pre-game scuffle in the tunnel, the opening exchanges were full-blooded but dominated by Scotland who showed plenty of attacking intent which yielded a penalty, kicked by Greig Laidlaw for a 3-0 lead. Buoyed by a vociferous Murrayfield crowd, the hosts consistently stretched the visitors’ defence and Jones collected a deft Russell grubber kick to dive over next to the posts to score Scotland’s first home try against England since 2004. England’s response after the break was emphatic with Farrell cutting a superb line through the Scottish defence to reduce the deficit to nine points in the 44th minute. 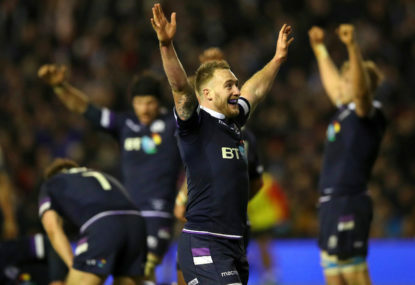 Russell’s resulting penalty gave Scotland a 12-point lead which they defended superbly to seal a stunning victory in Gregor Townsend’s first Calcutta Cup clash as coach.